Shipping and fulfilment represent two key considerations for any business delivering goods to customers. The delivered item is the first physical touchpoint that the customer has with your brand and so the timing, condition and quality of the delivery will be crucial. The shipping carrier that you choose will have a big influence over these factors and, consequently, on brand perception. Whether your shipments are packages or pallets, it’s key to find a shipping carrier able to meet your requirements and support positive customer service for your brand. It’s important to partner with a shipping carrier able to offer your business a range of services suited to your needs. Air freight or sea freight, overnight courier services, economy or premium services and the option of pallet services may all be useful, depending on what your business requires. Make sure your shipping carrier has some flexibility and doesn’t offer only a limited range of options. If that’s the case then you may find yourself having to balance a broad selection of different carriers to meet the needs of the business. Working with one carrier with a flexible range of options will always be simpler. You’ll normally find two different types of shipping available: tracked or delivery confirmation. Delivery confirmation is usually the cheaper option and will give you oversight on the shipment only at the point of departure and then delivery. So, a confirmed pick up is often part of the service and you’ll also get confirmation of delivery but there is no visibility in between these two points. Tracked shipments, on the other hand, involve more extensive visibility. Rather than being able to see only when a package was collected and dropped off, you’ll be able to monitor its progress throughout transit. Tracked services are usually more expensive but offer greater peace of mind. If your business has global shipping needs then a shipping carrier able to meet those requirements will be crucial. Cost effective international shipping can make life much easier for businesses – look for a shipping carrier that offers the types of services you need to the locations where you’re most likely to require delivery. Tracking is also an option for international shipments and may be essential if the shipment is high value. Customs is a consideration that is unique to international shipments. Every delivery that is sent internationally, from a single package to a huge sea freight shipment, will have to pass through customs at the country of arrival. 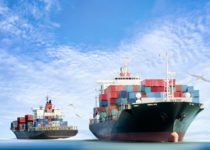 The shipping carrier you choose may be able to make it easier for your goods to navigate customs, which can save you time and money and help to avoid any unnecessary hold ups. At UCS we offer a range of domestic and international shipping options, from courier services to pallet services and domestic or international road freight. Contact us to find out more about options and pricing. next post: How can you improve your company’s inventory management for more accuracy?